*RACES 1 & 2 in the Rosscot Spring series on Sun 11th March, start from 12 noon in St. Aubin’s bay off the Gunsite/Hobie beach. Racing for H/Wildcats & Tigers, H16’s A & B Fleets also H16 Spi class. If you require a crew or helm please get in touch. There are 8 races in the series with 5 to count (3 discards) for the class prizes. The series finishes on the 6th May with the Prize Giving at the Clubhouse late afternoon. NOR & SI’s attached, please bring entry form to beach prior to racing and hand to the Beach Officer. 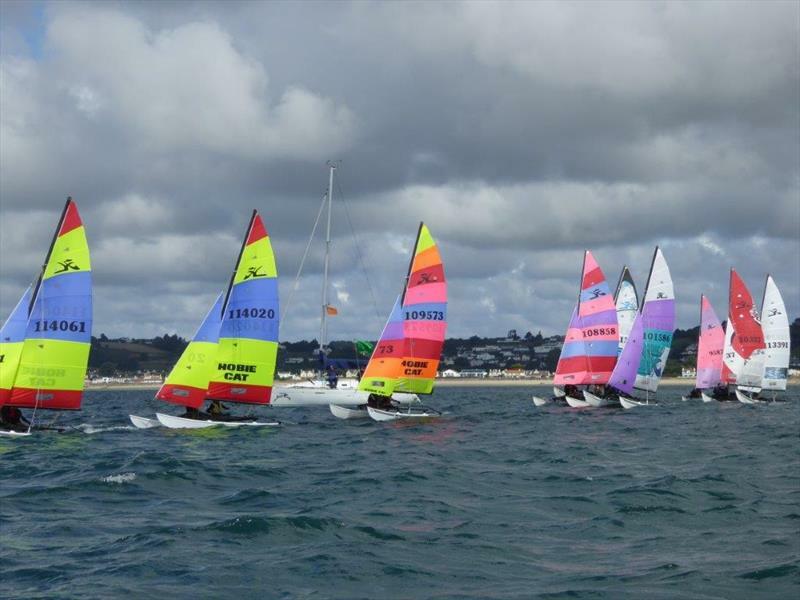 HOBIE DRAGOONS CADET sailing starts on Sunday 25th March. *THE FLEET extends great appreciation and thanks to Rosscot Accountants and Duncan Stuart for continuing to support the RCIYC Hobie Spring series. Duncan will no doubt also be out on the water as part of the race and guard boat team. *NOW IS THE TIME to raise boats from their winter hibernation, dust them off and clean them up, ready for the new racing season. Important: make sure to check any stays, holding the mast up including trapeze wires, if kinked or frayed, replace. Also check pins and split rings, good idea to tape up. *GREAT TO SEE some of the H16 Youth crews sailing occasionally through the winter months, they’ve not had to scrape the ice off as yet! hopefully won’t happen, now Spring is just around the corner. *RCIYC ANNUAL DINNER & PRIZEGIVING this Saturday 24th February, Hotel L’Horizon, it’s a sell out, over 200 members and guests are going along to enjoy the Clubs main social event of the year. Phil Sharp is the guest speaker, going to be very interesting hearing all about his 2017 winning and record setting achievements, flying the flag for Jersey and GB, it has been nothing short of spectacular. *GET READY to sheet in and max out in the forthcoming Spring series.